The Hunger Games: Catching Fire is a 2013 American science fiction adventure film based on Suzanne Collins‘ dystopian novel, Catching Fire, the second installment in The Hunger Games trilogy. The film is the sequel to The Hunger Games, and the second installment in The Hunger Games film series, produced and distributed by Lionsgate. Francis Lawrence directed the film, with a screenplay by Simon Beaufoy and Michael Arndt. Francis Lawrence took over from Gary Ross as director. Adding to the existing cast, the supporting cast was filled out with Philip Seymour Hoffman, Jeffrey Wright, Sam Claflin, Lynn Cohen, Jena Malone, Amanda Plummer, Alan Ritchson, and Meta Golding. Finally got round to watching the second Hunger Games movie, Catching Fire. After reading the book by Suzanne Collins, my expectations were low but the hype surrounding the movie made me think maybe they had improved it. 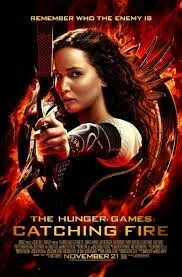 If you haven’t seen it or read the book yet basically after Katniss Everdeen and Peeta Mellark become the new victors they are forced to try calm down the rebellion that Katniss started they are thrown back into the arena for another fight to the death with the other 22 fellow victors from following years. The film stuck true to the book and was pretty good actually, the characters played their parts well. Jena Malone as Johanna Mason was brilliant, her contempt for saving Katniss and her allies was really believable. Haymitch Abernathy played by Woody Harrelson is one of my favourite characters, his love for Katniss and Peeta is hidden by his unrelenting stubbornness and sarcasm but behind all that there are a rare few moments where you can see how much he cares for the two. Harrelson was a great choice for this part. At the start it felt like it was being dragged out just a little bit too long but still good and covered some great points from the book which most films just ignore. However it wasn’t until they got into the arena that really caught my attention, it was exactly what I had imagined when reading the book. Brilliant directing from Francis Lawrence. The arena is my favourite part of the film since it’s such an amazing representation of the book, cannot praise it enough. The most gutting part is the ending it was such a let down after an amazing film, I didn’t like the way it just stopped after she found out about district 12 (trying not to give away too many spoilers). Maybe I’m just too impatient to find out what happens next and how they are gonna follow on from this but I felt it should have finished better.